When I was 4 years old, by some quirk of a mail disorder, one of the greatest inspirations of my life turned up in the mailbox by my front door at 121 Greenwich Avenue in Roosevelt, New York. I vaguely remember the brown paper wrapping and my mother opening the package. It was a book filled with black and white pictures and some writing that in my 4 year old preliterate state was unintelligible to me. I believe that the book was flipped through by the big people, my parents and two older sisters, and then was discarded in a pile of magazines where I discovered it and made it my own. 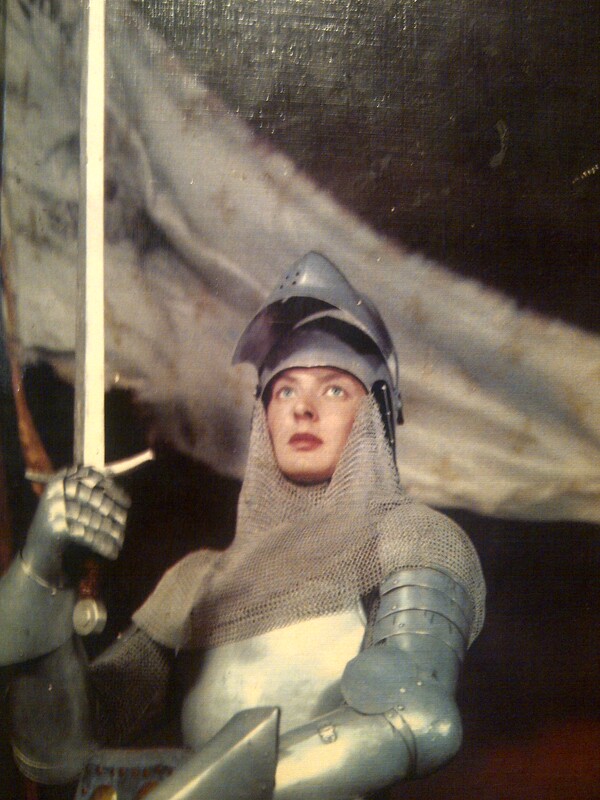 That was when I made my acquaintance with Joan of Arc. Of course at the time I didn’t know her name was Joan of Arc since I couldn’t read, but most likely someone had mentioned that name and I must have mentally acquired it. I know that I did acquire the book and I still have it; it is the screenplay for the 1948 movie Joan of Arc directed by Victor Fleming, starring Ingrid Bergman as Joan. It became my personal visual story even though all of the left hand dialogue was just letters on a page, the pictures spoke to me. First there was the cover, the only full color picture and the color is still glorious: blue background, a furling white flag with gold fleur de lis, her silver armor and her blue eyes and raspberry lips. Yes, the lady, the beautiful lady in shining armor. No woman I knew dressed like that, not my mother, or sisters or aunts or neighbors, certainly not Miss Frances on Ding Dong Schoolhouse. I loved this woman under the helmet holding a sword. I had seen pictures of the Statue of Liberty and maybe they were related, the statue did have a crown and was holding a torch. In Sunday School there were women like Jesus’s mother who dressed differently from a long time ago, but they didn’t look like the woman in armor. She looked so proud, confident and powerful. Her blue eyes were like mine. The pictures inside the book were more complicated, but even as a little girl I was aware enough of the symbolism of clothing to understand the progression of the story of Joan. In the beginning she was dressed in simple dresses and looked sweet with her head covered what we would have called a babushka. Then tunics and leggings. (Of course I didn’t know these words.) She was shown talking to a lot of men. And, praying a lot. Then suddenly on the next page, there she was in armor on a horse surrounded by men. Scary battle scenes. Bows and arrows. I had been introduced to Robin Hood and his Merry Men so I knew about shooting arrows, but this looked more dangerous. No one looked merry. There was a picture of her on the ground with an arrow in here chest. Then Joan in her armor talking to a king; I knew he was a king by his crown and robes. And then she was just dressed in black, simple black and really praying a lot and looking worried, crying. I knew she was in trouble. The last pages were the ones that I couldn’t stop looking at. The armor was gone, the tunics and leggings were gone, even the simple black outfits. She was all in white, wrapped in what seemed like a white sheet and they were chaining her to a post. She was surrounded by logs and twigs. Then the flames. Her face on the final page, eyes closed, still beautiful, swathed in smoke. Her clothing told a story. So did her praying. Toward the end she had reached out for a cross. Some of this I understood as some kind of Sunday School story. I wanted to ask my parents about this but something held me back. Maybe I thought they would take the book away from me. I didn’t know if they even knew I had it among my other story books, Babar and Alice in Wonderland and the Disney Classics. There was something that resonated with Snow White eating the apple and falling, Alice running from the Queen, Babar’s mother shot by a hunter. But somehow the last pages of all of those books ended with happiness, a reunion with loved ones, a return home. Joan, my heroine, was alone in the smoke, with a sign on her head I could not at that time read or comprehend, like Jesus on the cross but with no Easter Sunday resurrection, bunny, colored eggs, new dresses and jelly beans. At some point I showed the book to my sister Barbara, who was always the smart one in the family and 7 years older than me, and asked her why the story ended that way. She told me that Joan had gotten into a lot of trouble with those men because she told the truth. Getting in trouble for telling the truth has been very much in the headlines this summer. There has been the trial and sentencing of Bradley Manning. There has been Anthony Weiner running for Mayor of New York City and his truth and lies and just down right too much visual information. But my attention has been focused on Edward Snowden’s truth telling and the controversy of his legal right to tell these truths. No one it seems, even the United States government in general or President Obama specifically has denied that what Snowden has declared is true, just that he shouldn’t be sharing these truths. I have had many conversations with many people about this topic and the opinions have been as varied as the emails that have been read by the National Security Agency; meaning there are lots of different opinions even among people I know, ranging from Snowden being a spy who should be condemned to death, to him being a savior who is being martyred for his speaking the truth. The political environment has become a shifting landscape of relationships between super powers and developing countries accepting or shunning him, inviting Snowden as a guest or demanding his personal criminal appearance. Moscow might send him back home if we really really promise not to kill or torture him. Sounds a little Joan of Arc-ish. Saint or heretic? Maybe like Joan only time will tell the good guys from the bad guys in this story of truth-telling. And just as Joan wasn’t really the issue but was just the spokesperson for the big question, “who’s got the power, God or kings?” it’s really the same issue in the Snowden saga: who’s got the power of information? Government or the people? Was Joan of Arc a heretic or a saint? Is Edward Snowden a whistleblower or a spy? artificial heart implant and be able to go home thanks to a portable pump. Is there some national security that can prevent these deaths of 200,000 American citizens every year? Can the NSA read all the medical records looking for medical errors that kill people rather than spending time reading everybody’s emails looking for terrorists? What is important to know is that as cited in the article states don’t use the same reporting guidelines and that includes who knows about the mistakes including patients and their families, i.e., sometimes even if you get the wrong medication, or the wrong procedure, or some little inconsequential sponge is left inside your body you don’t have to be told about it. Maybe it’s just better for you to not know. Just like if someone is reading your emails you don’t really have to know about it because maybe it’s just better if you don’t know about it. Maybe this is keeping all of us safe. Maybe not. 200,000 Americans die every year and we don’t know much about that, or who is protecting us, or how to protect ourselves. reasonably believes constitutes improper quality of patient care. Whistleblowers in health care need not fear, they are protected by law. So no hackers required. No one who works in health care can be penalized, forced to flee, ostracized, accused of being a witch, blasphemer or heretic, if they blow the whistle to inform a public body that there is a risk to safety, health and well-being. They are protected. I just wanna see you.